(Wendelsheim, Germany / Oakland, California) AESKU.GROUP – a science-focused manufacturer of autoimmune, allergy, and infectious disease diagnostics – received 510(k) clearance from the U.S. Food and Drug Administration (FDA) for AESKUSLIDES ANCA Ethanol, and ANCA Formalin with the new HELIOS AUTOMATED IFA SYSTEM. Next to be submitted are esophageal and tissue section slides. 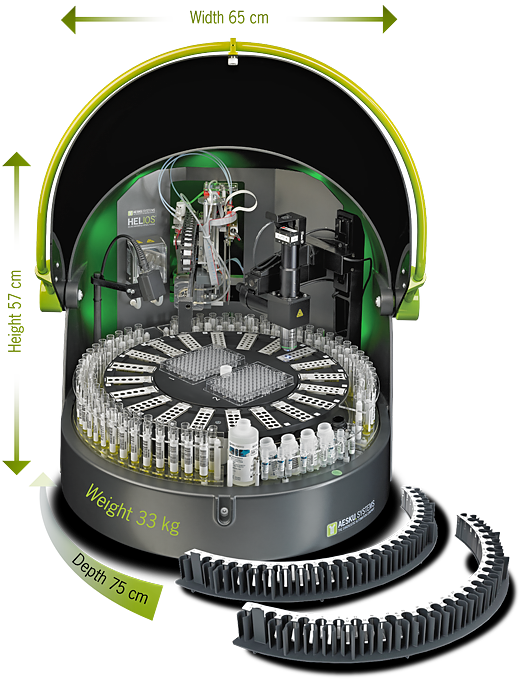 HELIOS is a revolutionary system that automates the complete pipetting and image capturing of IFA (immunofluorescence) tests. It is the first and only system to automate this process completely from beginning to end - offering unparalleled process control, traceability, standardization, ease of use, and maximum efficiency by requiring technical intervention only for expert review. The HELIOS processor is capable of performing all IFA processing and reading automatically. The HELIOS uses the robust and widely adopted HELMED IFA Software, which is compatible with most IFA test kits, regardless of their manufacturer. However, non-AESKU slides will be processed without reading. This module starts automatically after slide processing is complete or can be used independently from other modules. The well imaging positions and image number is user configurable for all AESKUSLIDES tests, prior to reading. A Pre-Classification suggestion ( + or - ) is performed for each image for AESKUSLIDES ANA HEp2, ANCA, and nDNA. All IFA analysis data can be loaded and evaluated patient by patient. The evaluation process is complemented by the AESKU pattern library. The “show all negatives” option displays all pre-classified negative results, helping to save reporting time by automatically releasing the negative results with the push of a button. The “sample overview” option allows all results related to one sample to be compared side by side. Activating the pattern recognition tool give the Helios the ability to autonomously suggest the most probable IFA patterns for Hep-2, ANCA, and nDNA. In addition, an End Point Titer determination from one serum dilution can be performed atomatically. This module is used to manage pre-classification settings and user rights. The LIS Module sends all classified results to the LIS. ASTM standard connection configuration is done via a user-friendly interface.